More Small Cotton Bags With Small Teddies! Here are 4 more Small Cotton bags, each one with a small teddy sleeping inside, wrapped in his or her own crochet blanket. I am making quite a few of these in the run up to Christmas, as they make excellent gifts, being suitable for all ages. I try to make each small cotton bag in a different pattern to the rest, so each one is personal to the child who receives it. I’m sure you know a little someone who would love one! Posted on October 31, 2017 October 24, 2017 by Silvi VealePosted in Cotton Bags, Little Bags, Teddy in a bagTagged all ages, Children's bags, cotton, small bags, small teddy, Teddy Bags. The ‘tassle’ bag is a new design I am making. The first few are in pink-multi like the pretty bag above, but there will be a number of different colour combinations to follow. All these bags have a full lining. And of course every bag has a front pocket with a tiny teddy inside. Tassle bags are a size up from our smallest bags, so there is room inside for quite a few small items. Tassle bags are for sale at £6.00 each and they would make a lovely gift for anyone over three who loves pretty bags. Posted on October 29, 2017 October 24, 2017 by Silvi VealePosted in Shoulder Bags, Teddy in a bagTagged Children's bags, Crochet Bags, Older Children's Bags, Shoulder Bags, tiny teddy. There are so many lovely cotton fabrics that I am trying to make these crisp cotton bags in a number of colour combinations. This particular bag has pretty lilac roses on the outside and lilac with white polka dots on the reverse side. And of course there is a tiny teddy in the pocket. This style of cotton bag is medium size with a shoulder strap and lots of room for all those essential items. They retail at £8.50 each. Posted on October 27, 2017 October 24, 2017 by Silvi VealePosted in Cotton Bags, Shoulder Bags, Teddy in a bagTagged Children's bags, cotton, medium bags, Older Children's Bags, Teddy Bags, tiny teddy. There is such lovely cotton material available to make bags, and I am still enjoying making crisp cotton small bags in a range of patterns. This small bag is in two pink designs and is reversible, so you can choose whether you have small, dark pink roses or larger white roses on the outside. And of course, inside the bag is a small teddy wrapped in a crochet blanket (just the thing for those cold winter nights 🙂 ). This last picture shows the bag minus the teddy, so you can see more of the inside (or outside…) design and that it is roomy enough for carrying a few small toys or any other essentials. With the small teddy and no extra tags or buttons, the small cotton bag with small teddy inside (in his blanket of course) is suitable for all ages. All of our small cotton bags retail at £6.00 each and this includes the small teddy and his/her crochet blanket. Posted on October 26, 2017 October 20, 2017 by Silvi VealePosted in Cotton Bags, Little Bags, Teddy in a bagTagged all ages, Children's bags, cotton, small bags, small teddy, Teddy Bags. Here is another of our small crochet bags with a tiny teddy in the front pocket. This one is in dark pink ‘sparkle’, with a nice cream trim and cream bow/drawstring, and it looks very ‘festive’ and ready for Christmas! These bags may be small, but they have room for many of those ‘little essentials’ (and there’s still room for the tiny teddy in the front pocket, unless he wants to come out of course). As this design has a tiny teddy, it is for children (or adults) over three years old and I am sure there are many who would love one! Like our other Small Crochet bags, these (including the tiny teddy in the front pocket) are for sale at £5.00 each. Posted on October 24, 2017 October 20, 2017 by Silvi VealePosted in Little Bags, Teddy in a bagTagged Children's bags, Crochet Bags, Older Children's Bags, small bags, Teddy Bags, tiny teddy. I really enjoy making these new Small Cotton Bags, so, among my other posts over the next few days, you may well see pictures of more of these bags for children of all ages. This particular bag is again in crisp cotton, and is very much a patchwork design, using 4 different bright designs which complement each other. And, as all of these small cotton bags are reversible, there should be something to please everyone. Posted on October 22, 2017 October 20, 2017 by Silvi VealePosted in Cotton Bags, Little Bags, Teddy in a bagTagged all ages, Children's bags, cotton, small bags, small teddy, Teddy Bags. Introducing all new small cotton bags with a small teddy wrapped up and sleeping inside! I try to make bags for children of all ages, and all of the bags I make are suitable for children over 3 years, but sometimes it is good to have a bag (and teddy) which is suitable for under threes too. I recommend the small crochet bags with a small teddy in the large front pocket for under threes (Here are a couple of examples: Dark Pink Sparkle Bag With Small Teddy and Rose Pink Multi Bag with small Teddy) and the backpacks (like this for example: Backpack for Children with Small Teddy ) are fine too as they have a small teddy in the pocket (rather than a tiny teddy) (just be aware of the toggle fastening on the backpacks – they are sewn on incredibly tight, but please be aware). Introducing all new Small Cotton Bags with a small teddy inside wrapped in a crochet blanket. Each bag is made in crisp cotton with no fastenings (and each bag is reversible for a whole new look too). Each small bag is slightly different, with a mix of colours and patterns, but they are all very appealing. 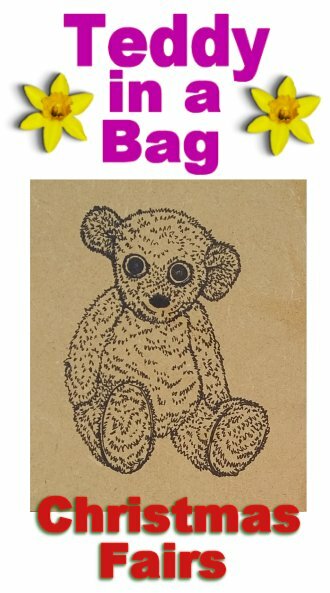 The Small Cotton bags with Small Teddy in blanket included are for sale at £6.00 each. Posted on October 20, 2017 October 19, 2017 by Silvi VealePosted in Cotton Bags, Little Bags, Teddy in a bagTagged all ages, Children's bags, cotton, small bags, small teddy, Teddy Bags.